Silent films are nowadays seen like a distant thing, something none of us should bother watching. But thank God – or, more precisely, thank Michel Hazanavicius – The Artist gave this genre a chance a couple of years ago. I’m not saying, of course, that every single movie should be made that way, not at all: progress exists for a reason, and we ought to be thankful for the evolution within the cinema world. But it is good to remember some of these films from time to time, as well as letting other people discover these gems, or else, everybody will think that movies began with Taxi Driver. Not going to lie here, some silent films are boring as hell. If you have two hours of pantomime, they better be good and meaningful. They were used back then, but now that we have the privilege of watching “talkies“, the point of the silent ones might seem irrelevant. There are so many good films: everything in the comedy genre, from Buster Keaton to Charles Chaplin; one of my personal favourites, The Crowd, Abel Gance’s fenomenal Napoleon, or anything with Lillian Gish. 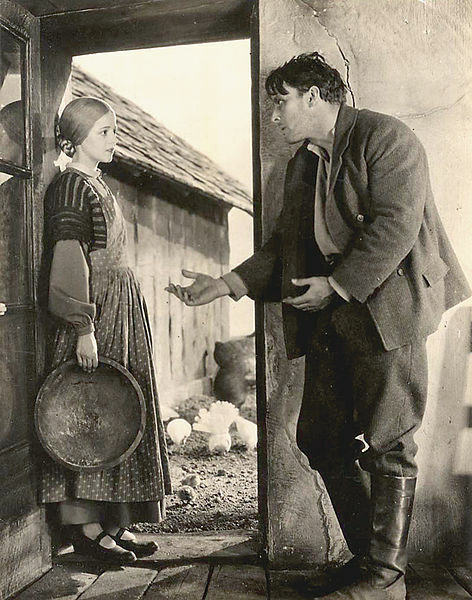 But the one I want to talk about is another one, the very first silent movie I ever saw: Sunrise. Sunrise: A Song of Two Humans is a simple story about a man who cheats on his wife, only to eventually realise that he still loves her. That is the plot in a nutshell. Beyond that, it is about finding something that was always there. In this case, romance. The man loves his wife, and it takes an almost murder to see it. As it happens, they both just needed some perspective to notice that they belong to each other. Life issues and such. This movie should be particularly important because its female lead, Janet Gaynor, was the first winner ever of the Academy Award for Best Actress, back in 1929 – they rewarded motion pictures from 1927 and 1928 -. Also, it was directed by German filmmaker F. W. Murnau, one of my favourite ones from that era, and who also directed Nosferatu, the movie that makes me keep all the lights on for a week every time I watch it. Only two more personal trivia facts that I would like to add. One is that, when I first saw it, I found George O’Brien, the male lead, to have a very modern face. It is quite strange to think that, but he was the only silent film actor with whom I had that feeling. All the others always looked very early 20th century, if that is a thing. Oh, the other trivia: as it is one of the first movies after “talkies” were invented, it incorporated its own soundtrack, and this included Marche funèbre d’une marionnette by Charles Gounod, which would become the theme of Alfred Hitchcock Presents, which has been my mobile ringtone for the past six years. Please, take your time and watch this film, it is highly recommendable. And I guess that it is in the public domain because of copyright expiry or a similar issue. Let’s not even think about that, just enjoy this “song” about a man and a woman.